The artist should not worry over the loss of his early bloom. People were not peaches. Like guns and saddles, they were all the better for becoming slightly worn. Saturday night was the opening of my latest show at the Burson Gallery in Hillsboro, Texas. Five artists opened the night, and I was proud to be displayed along with them. I had to take my photos from an angle, to keep as much glare as possible off the glass. I apologize for the distortion. In spite of his own writing difficulties, Ernest played Dutch uncle to Fitzgerald, repeatedly urging him to get forward with Tender is the Night. The only thing to do with a novel, said he, was to finish it. Today, I decided enough is enough. I’m tired of this sickness that has been draped all over me like a cheap suit for over a week now. Today is President’s Day, no school. And though I am still weak, I am tired of the lethargy, the sleeping, the moping and the self-pity. Reading this morning from the Hemingway biography gave me the necessary kick to get up and return to the cave, and finish this darned still life that I’ve been mooning over for far too long. It is time to get on with the next endeavor. This one is done. The only thing to do with a painting is to finish it. There was nothing left to do but work a little more on shading the lantern and signing my name. After spending some morning time staring, painting, staring some more, painting some more (again, I felt like I was Willem de Kooning, who was laughed at for staring and contemplating more than actually painting), I finally decided I did all I could, and that it was time to move on to something else. I am grateful for Dutch uncles as Hemingway was to Fitzgerald, and Jackson Browne was to David Crosby, nudging him to complete The Delta (one of the most moving songs ever to come over me). Nobody thinks twice about the work-in-progress, the Ph.D. all-but-dissertation or the season that almost was. I find just as much joy as anyone in the process of creativity, but how much more I love looking at something finished, a fait accompli. So, thank you, Carlos Baker. Your published word this morning became oracular to me, when I need it the most. And thanks all of you who read me. I am still too sick to feel effective as a teacher today, though my students are treating me with respect and deference, and doing their tasks. I am just hanging on, trying to shake the lingering effects of strep throat and a nasty sinus infection. It has sucked all the energy out of me. Nevertheless, I want to attach a piece of fiction to this painting. The scenario has been moving about in my head for a couple of weeks now, so I thought I would try to put it out there in print. The quiet neighborhood was shattered by the sharp crack of three crushing blows from the ball-peen hammer that broke open the padlock on the old fisherman’s shed door. Day-before-yesterday, they found him dead, seated upright in his favorite back-porch metal lawn chair, with a cold cup of coffee and his tattered copy of Whitman’s Leaves of Grass on the side table. Beneath the layers of his faded beard, they thought they could detect a slight smile. His book was opened to “Song of Myself” and he had underlined in pencil: “I am large; I contain multitudes.” The onlooking friends mused about his eight decades and all that his life had encompassed. Entering the dim interior of the fishing shack, they looked silently at the tangled pile of gear in the corner, and hesitated to gather it up, as though rudely disrupting the sanctity of a shrine. There lay the Garcia Mitchell 300 open-faced reel, with which he had landed his 6-lb. largemouth bass while poking about the lily pads in a rowboat one evening on Hunnewell Lake. He was only a teenager then. The bait caster was still there–the one he never could seem to get the hang of, trying in vain to cast old wooden bass plugs without backlash. His Uncle Art would just look on, shake his head, smile, and mumble through the smoke of his Lucky Strike: “Cute Kid.” The Pflueger fly reel and vintage bamboo rod were a gift from an aged farrier in Pine, Colorado, who passed them on as a torch, noting that his fly fishing days were behind him. The battered suitcase was from college days back in ’42, when he hopped the Frisco passenger train for his monthly cross-the-state visits to his parents back home. And on that train, he was always served Dining Car Coffee. And the old knapsack–he never tired of bragging on the day he talked an Athenian merchant out of that tattered leather bag for $12. On that day, he owned the world. The friends stood there silently, their eyes surveying the stack of assorted memories, each item with its own story, clinging to its own fragment of history. And now it was time to take down the monument and move on. New chapters were waiting to be written. I have laid down the brush for the night. Tomorrow, in the daylight, I’ll take a fresh look at this. I have tried tonight to push the lantern back more into the shadows. I don’t know that I have done that enough yet. I cannot take a decent photo of this large painting at night, because my studio lights are grossly inadequate for photography, and so are my house lights. So, tomorrow I’ll do some more shooting and posting. Once I’m convinced that I have done all I can, I will sign it can say “Done!” And believe me, I’ll post it, yet again! I wish I had something interesting to quote, or to say. But I’m still very sick with this crud. I worked our District Spelling Bee, and I was devastated by day’s end–had to come home and head straight for bed. Feeling really puny tonight, but glad nevertheless that I got to paint. I’m just not thinking too clearly. Though still sick, I really wanted to get into the Cave for a little while tonight and try to finish this large still-life. It isn’t going to happen tonight, but I am closer to closure. I just photographed the lower half of the painting, because that is where I did all of tonight’s work. 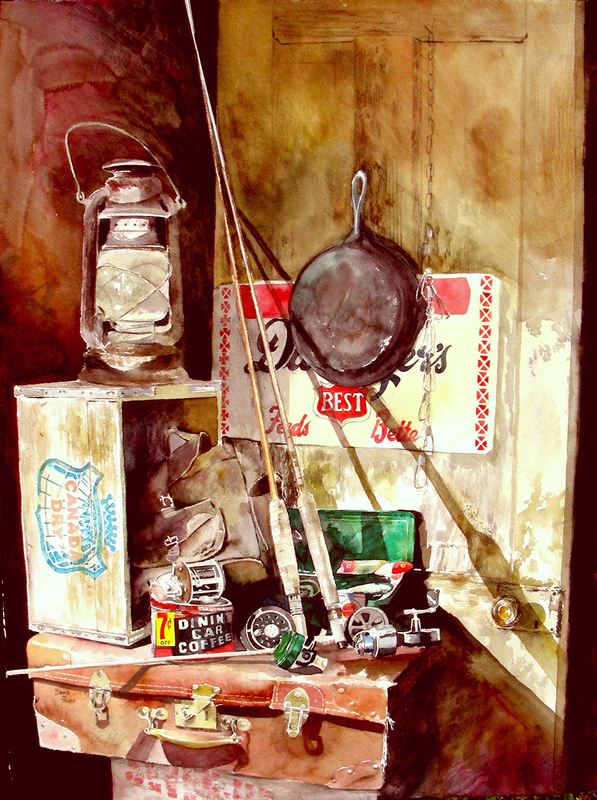 I painted the left latch of the suitcase, laid the shadow under the Garcia Mitchell open-face reel, painted the handle of the left fly rod, faceted the left fly rod. and that’s about all I had in me. I’m still not over the sickness that has plagued me since Saturday. I hope that I can finish this entire painting tomorrow night. I should be closer to recovery by then, now finishing three full days of antibiotics. When they got back to Paris, the December rains were gone and the weather was clear and cold. After the vast reaches of Switzerland, the apartment seemed small and crowded. Ernest rented a bedroom nearby on the top floor of the tall old hotel where Paul Verlaine had died exactly twenty-five years before. Here he could be quiet and alone, taking contemplative turns around his chilly citadel, keeping warm with the bundles of twigs he bought in the streets, and gazing out between sentences on all the roof and chimney pots of Paris. Sometimes in the afternoons he went to walk the graveled paths of the Luxembourg, stopping in at the Musee for a look at the Cezannes and the Monets, thinking inside himself that they had done with paint and canvas what he had been striving to do with words all morning in his room at the old hotel. The Man Cave was cold tonight, but I huddled in my hoodie and worked for about 30 minutes on this painting, thinking that what Hemingway has done with words on paper, I have attempted with watercolor on paper–direct treatment of the thing itself without embellishment. Underlying the sense of truth, I think, is the notion of authenticity, that somehow or other the artist rather than being a skilled craftsman is someone instead who is inspired, is a kind of seer. I worked in the Man Cave until about 2:00 a.m., unable to shut down my motor, I was loving the experience of watercoloring so much. When I finally retired to bed, I set this painting on a stand at the foot of the bed, so I could go to sleep, gazing at it. I woke up to it, sick. That darned upper-respiratory infection that I catch every year around January-February, while all my students are busy sharing their flu viruses. There is no escape. I wondered this year if I would get through, usually I get it by mid-January. Oh well. I’m down for the count. But I can sit up in bed and read until the weekend clinic opens. And I can look at my painting. I want to take a moment and record my deepest, heart-felt satisfaction over what is happening in my recent work. In response to the Jack Flam quote posted above, I don’t mind mentioning that for years I have wanted to go beyond craftsmanship and feel that I am truly an artist. I have wanted to get past the stage of feeling that I was a mere illustrator and feel that I was a legitimate watercolorist. And then, I was liberated several years ago, thanks to Richard Meryman’s Andrew Wyeth: A Quiet Life and Gail Levin’s Edward Hopper: An Intimate Biography. In reading those works, I discovered that these great artists struggled throughout their careers, labeled by some critics as illustrators and mere technnicians. Before reading those works,I always groused, thinking that someone would view one of my watercolors and think “Oh what great detail, what talent,” instead of feeling the sentiments that I always feel when looking at a Hopper or Wyeth. When I look at their works, I feel the loneliness, the calm, the alienation, the quiet–and don’t obsess over their details and craftsmanship. So, for years, I would wonder, “How does one get past the issues of craftsmanship and go about painting ‘mood’? How does one express feelings in a painting?” Turning to my own work, I tended to discount it as merely decent craftsmanship, but not true artistic expression. Perhaps, following Emerson’s vein, I just rejected my own work, because it was mine! Today, as I calmly look at this watercolor nearing its completion, I can testify that I am feeling very good about its “look”, that what is on display is not mere craftsmanship, but an actual painting, with a particular dynamic, a mood, a feeling. And the reason it changed (for me) from being a work of craftsmanship to an actual work of art is because for the first time, I actually looked at the painting (yesterday morning) with a concrete issue to fix–the problem of lightness and not enough darkness. 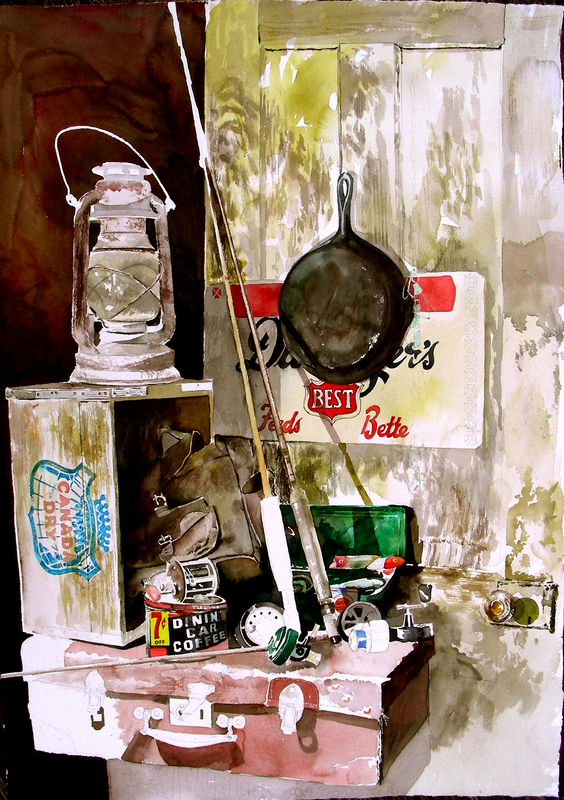 For anyone following this blog, you already know that I only recently turned to still-life subjects, having engaged in plein air landscape painting for a number of years. I had always been too intimidated to try my hand at still-life, feeling that the objects were too close and personal, too unforgiving when mistakes arise from inadequate drawing skills. But I finally took the cold plunge, practicing on a number of 8 x 10″ watercolor sketches (all published on this blog) before moving to large 28 x 22″ compositions. Once I made the transition to the larger size, I immediately realized that I had an issue with lighting. all my large watercolors are light, there is so much bright white surface to cover, and landscape painting generally lends itself well to that light, to that sense of atmosphere. 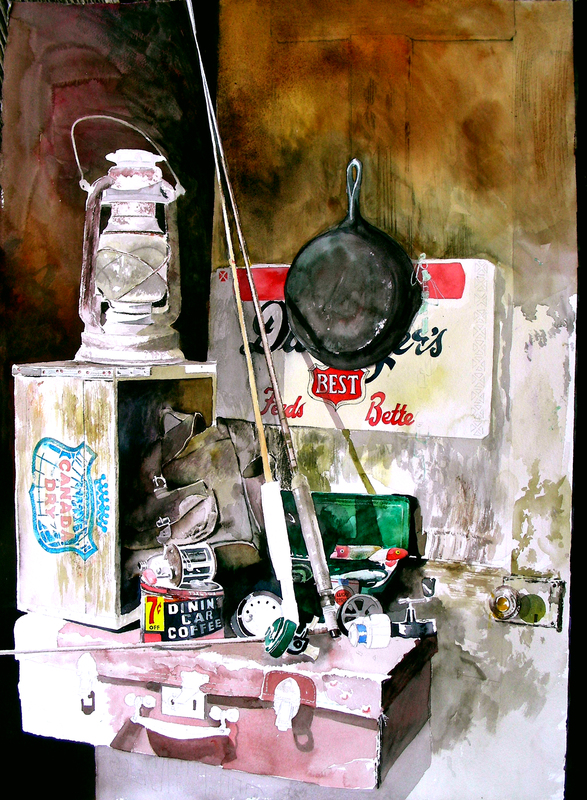 But my favorite still-life arrangements from art history are those which feature dramatic, dark settings, and Andrew Wyeth’s watercolors of dark interiors have inspired me the most. So, yesterday I decided to go for broke. Realizing that my current painting was just as light and airy as the earlier large still life I had painted weeks earlier, I concluded that this one needed some serious darkening. Naturally, I was anxious about such a bold and drastic move, knowing that I could not stop with merely darkening the background. Everything in the picture would change with a darkened background, and therefore would need adjusting. And beyond all that, I knew the risk that the entire painting could collapse in ruin, after nearly a week of carefully constructing it and getting personally attached to it. Nevertheless, I set to work, blending Winsor Violet with Transparent Yellow, then stirring in Permanent Rose, Winsor Green and Alizarin Crimson as needed, to create the dark values. My heroes of the dim indoor compositions include Andrew Wyeth, Rembrandt van Rijn and Jan Vermeer. I have always loved their deep sepia tones, but never knew how to mix that kind of hue myself. I think I am finding something with the combination of colors mentioned above. I hope you will pardon this rambling blog entry which began early this morning, and now, by 10:36 p.m. is still under construction. I awoke around 4:00 a.m. with a severely irritated throat. By the time I rose at 7:00, I knew I was going to be visiting the weekend Family Healthcare clinic which opens at noon. I did, along with 450,000 other patients from Tarrant County. Two-and-a-half hours later, a doctor finally examined me and discovered that I had strep throat. So, since then I have returned home, taken antibiotics, sat up in bed reading, dozed, blogged, but mostly sat staring at this painting at the foot of my bed, which is about the only positive thing that happened under this roof all day. 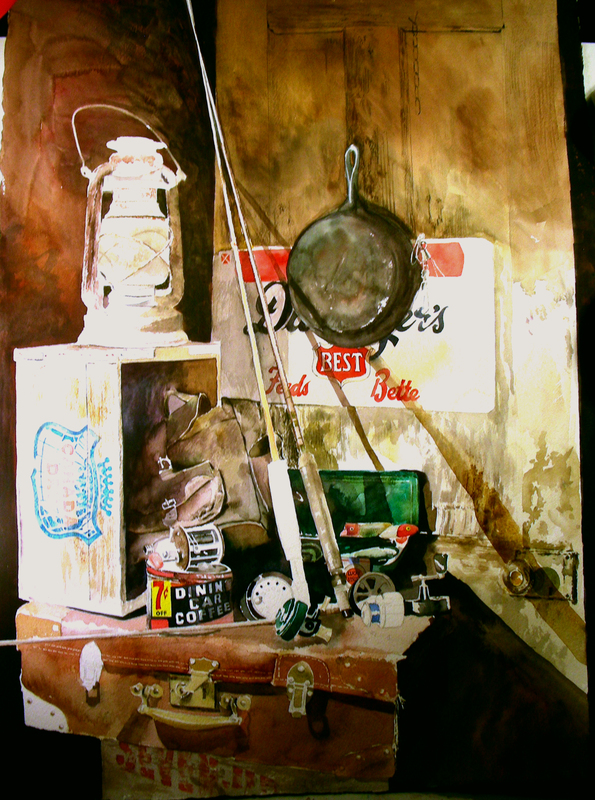 I am pleased, because the watercolor is actually beginning to emulate (not imitate) Andrew Wyeth and his 28 x 22″ drybrush watercolor interiors. His painting “Alvaro and Christina” was the work that inspired my last large still life, and this one. But with this one, I finally found a way to deepen the shadows and give a darker overall look to the composition. And I am very happy with that step. It’s very easy to spend your old life swishing old tea around in your cup thinking it’s great stuff because you’ve never really tried anything new. 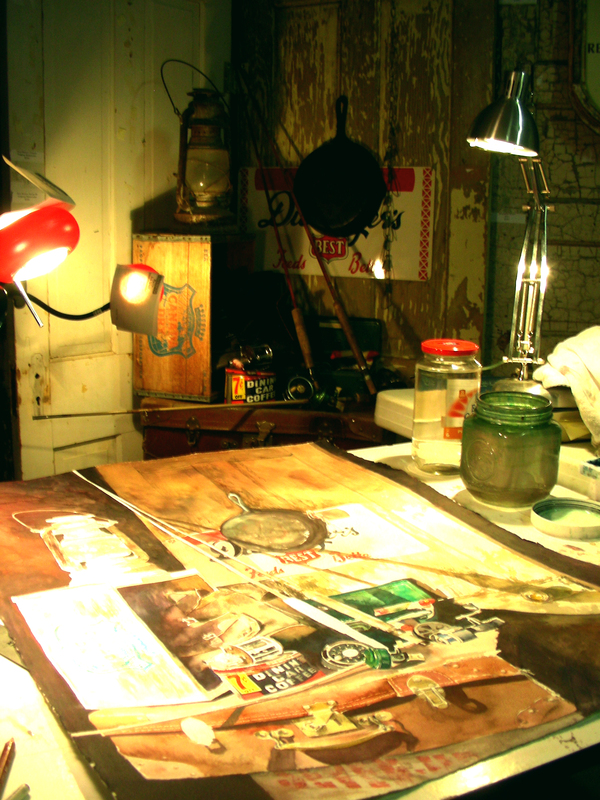 I am pleased to be trying several things new–still-life, large compositions, dramatic light and darkness. There is so much still out there to explore, and I am grateful to have strength and time to do that. This will most likely be my final post of this day. I am exhausted to the bone, having worked on this watercolor still life, with very little interruption, since 9:00 this morning. 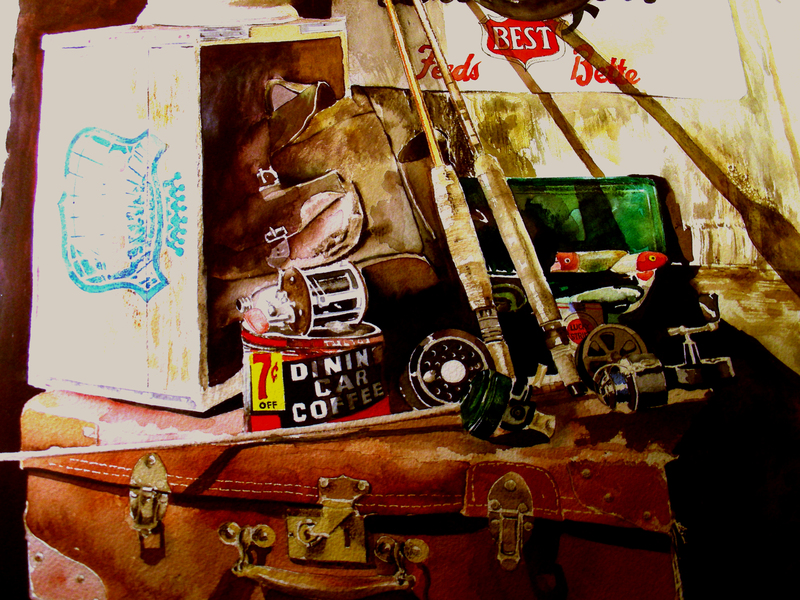 I am glad that I made the decision to darken the upper-third of the composition, then to enrich the colors on the vintage suitcase below, and finally throw a shadow off to the right of the suitcase. Finally, the arrangement seems to be taking on some drama, thanks to the contrasts. I am getting closer to what I designed–that is, to create a darker, dimmer interior surrounding the subject matter, in hopes that the eye will go more willingly to the subject. But boy, am I tired now! I’m sorry I don’t have any interesting reading to post–I haven’t done any, save for the little bit of Hemingway biography this morning. Maybe some reading tomorrow, when my eyes are open. Thanks always for reading me. And thanks to all of you who posted and emailed me today. Your comments are always invaluable. One can have a really super work nine-tenths completed, and then one does one little element and the whole thing suddenly is off again. 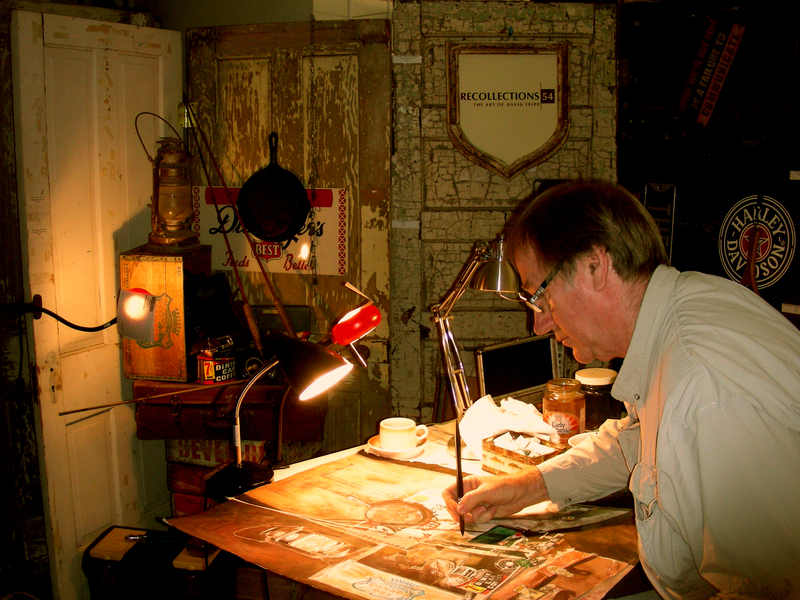 How unusual to awaken at dawn on a Saturday, already in the mood to enter the studio. I didn’t! The warm bed was too nice and the 40-degree weather didn’t make the garage sound all-that-inviting. So I slept a couple more hours, then rose. Entering the Cave at 8:00 was still early enough for me on a Saturday. 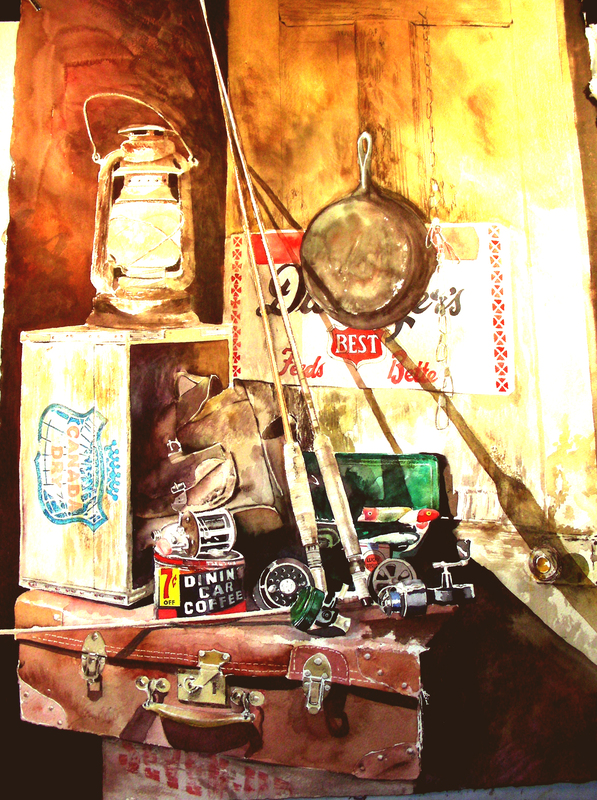 The Hemingway biography was waiting, and so was the watercolor. I propped up the watercolor so I could look up at it occasionally while reading the Hemingway biography, and hopefully make some written notes about how to proceed with it. But after I recorded my fifth suggestion, W H A M !!! a composition problem that had bothered me from the outset of this painting blasted to the surface. I was always grousing over the issue of darkness, and why it never happens in my watercolors. I continually looked at Andrew Wyeth watercolors of dim interiors, particularly Alvaro and Christina. And then, suddenly the thought struck me–darken the light-colored door, all the way to the skillet. 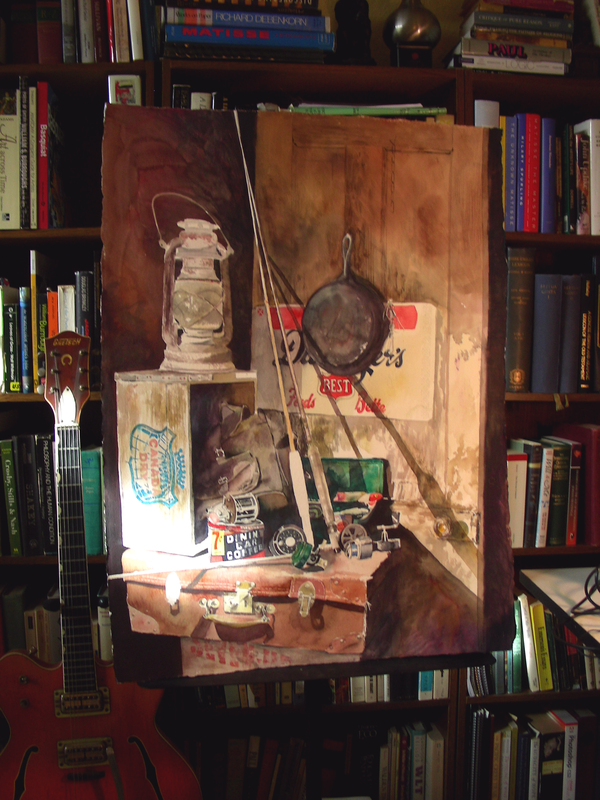 In doing that, perhaps the dramatic lighting will be concentrated more on the actual still life, instead of dispersed throughout the door in the upper-third of the composition. 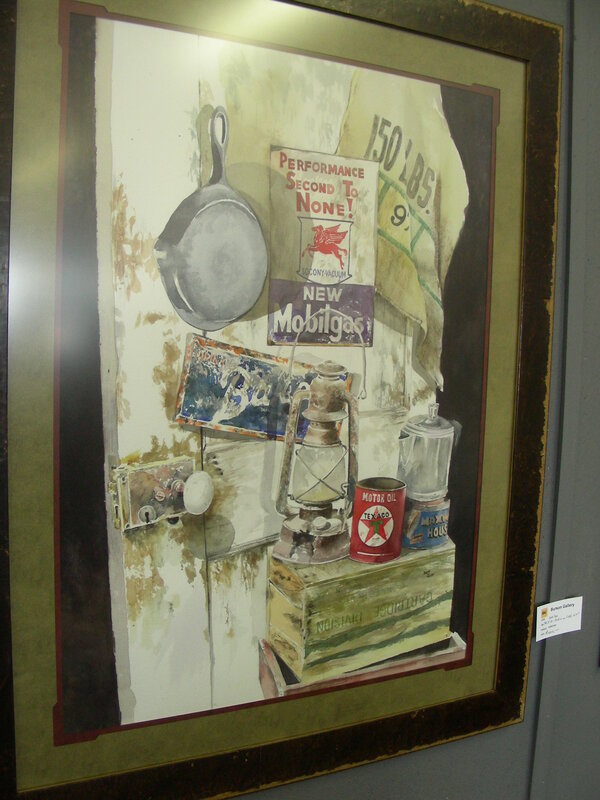 Perhaps then the viewer’s eye would go more quickly to the congeries of objects clustered at the heart of this composition. Right now, I only see the upper-third of the composition competing with the heart of it. Well . . . after days of investment in this still life, I suddenly felt “tight”–suddenly gripped by the fear of losing this painting after all those days, blowing it, destroying something that had promise. As Motherwell mentioned, a work of art 9/10 finished, and one little thing makes it collapse. 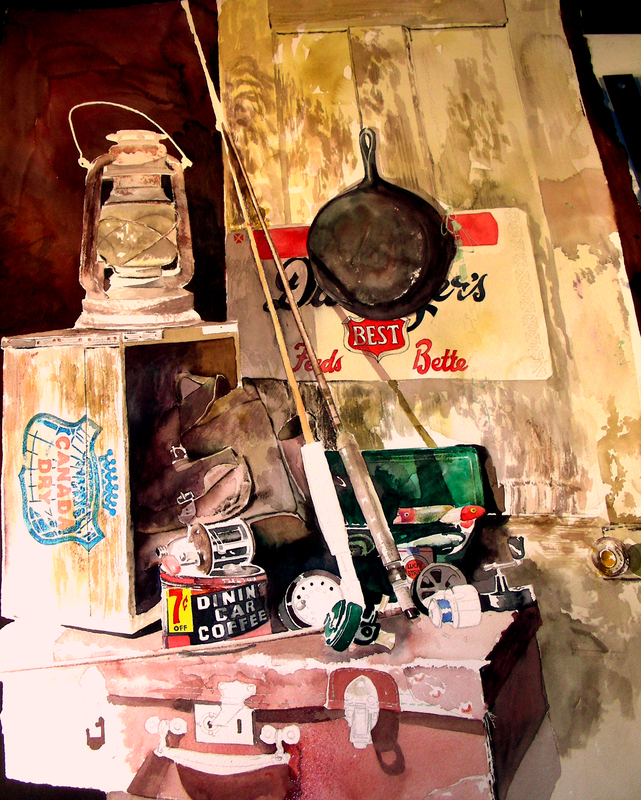 However, I have found nothing but dissatisfaction with this still life being so light, no matter how dark I made the upper left corner, or the skillet, or the inside of the Canada Dry crate, or the shadows to the bottom right of the suitcase. 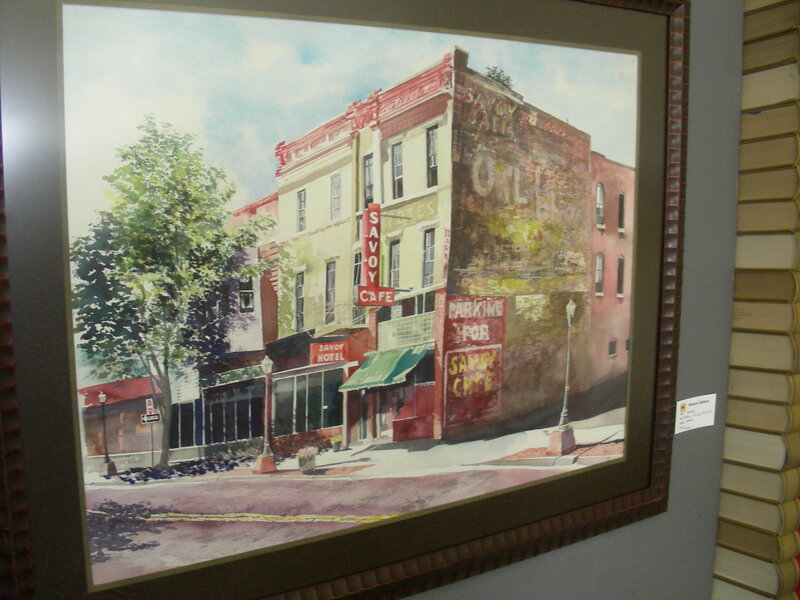 The overall painting, to me, was still light, and that is because of that gigantic light-colored door behind it all. I wrote in my journal–THINK ABOUT IT. Don’t rush. Think about it. This is going to be a profound step; it’s going to change everything–the lantern, the crate, the backpack inside the crate, the rods sticking up through the composition. This could be like pulling a thread from a garment, and you keep pulling till the sleeve finally falls off at the shoulder. Ruined. THINK ABOUT IT. Oh hell, read more of the Hemingway biography! So, I did, for another hour. 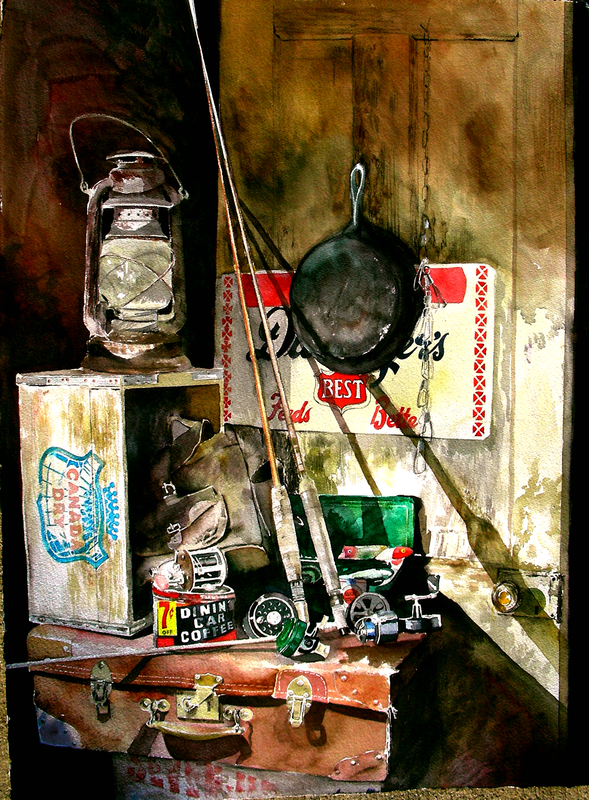 As I continued to read about his notion of courage required to be a successful writer, I finally sighed, put down the book, and went to work, soaking the upper third of the painting and laying down wash after wash of stained colors, slowly deepening the value of the door behind the still life. Now the light outside is fading for good–it has been dark and overcast, threatening rain all day in Texas (teasing actually–it hasn’t rained at all here). At 3:30 I am convinced that the light will not return, so I took the painting outside to photograph under natural light, and now post it below. This is how it is now. I am going to leave the background alone for the time being and return to wok on the suitcase at the bottom, then the shadows below it. I cannot change what I have done, and I am glad I like it better than before–this was not an easy step for me, this late into the painting. But I’m glad I sucked it up and did it. It is never the deed men praise, but some marble or canvas which are only a staging to the real work. . . . The true poem is not that which the public read. There is always a poem not printed on paper, coincident with the production of this, which is stereotyped in the poet’s life, is what he has become through his work. . . . Perhaps the hugest and most effective deed may have no sensible result at all on earth, but paint itself in the heavens in new stars and constellations. Its very material lies out of nature. When, in rare moments, we strive wholly with one consent, which we call a yearning, we may not hope that our work will stand in any artist’s gallery. 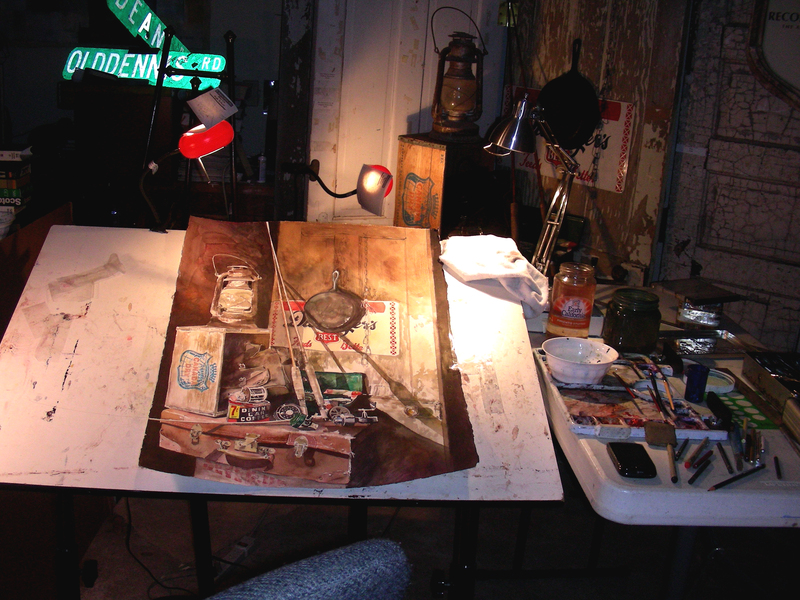 At 5:00 this afternoon, when I stepped into the studio, I just couldn’t find the impetus to begin painting. So I sat, poured myself a fresh cup of coffee, and set to reading from the Journal of Thoreau. And I was arrested by this passage. I love it when a thinker celebrates the act of making art, rather than the record of the deed. The art is in the making. For several years now, I have known this joy of making art, and not being quite as obsessed with the results. If the painting comes out terribly, I can still say that the task of making it was a pleasant one, a rewarding one. Work on this still life is starting to speed up. This afternoon I worked on darkening the skillet on the door, then working further on the woodgrains of the door itself. I then refined some of the details on the vintage fishing reels littered across the bottom of the arrangement, as well as one of the handles of the fly rod. I was surprised by a drop-in visit from a pair of great friends, true kindred spirits whom I have known for several years now, friends that share my enthusiasm for art, music and educational issues. The chat that ensued still has me inspired as I continue to work into this night. I was sorry to see them go, even though we put in a nice long evening of conversation. Once alone again, I realized that I had not yet made dinner (it was 10:30!). Once dinner was over, I came back out into the Cave and began work on this suitcase. And there is where I leave it tonight. I’m still trying to build stronger contrast, and create darker areas in this composition. Nevertheless, I’m pleased with some of the objects that are now beginning to take shape. I look forward to more fun with this tomorrow.